Research Paper: Digital to Physical – Made to Last? Will functioning digital art be part of our future cultural heritage? Digital to Physical – Made to Last? Will functioning digital art be part of our future cultural heritage? Artists embarking on a digital art practice must make several decisions relating to the work they wish to produce. Is the finished artwork to be a physical object, a digital presentation, or a combination of both? Is it to include a performance, existing only for the time that it is exhibited, or is it intended to last in the same way as traditional art, such as a painting? Is the work intended for sale, to function as part of a permanent collection, or for display only in temporary art exhibitions? A wider consideration and concern is the question ‘will functioning digital fine art be part of our future cultural heritage?’ Some established artists think not. This paper examines the underlying reason for this belief, namely the impact that accelerating changes in technology have on the conservation of digital art. It examines how these issues are being addressed by the various stakeholders involved, including artists, educators, researchers and art institutions. Finally, observations and proposals are made, in particular recommendations that practicing digital artists can employ to help their own artwork survive into the distant future. The proliferation of new digital technologies employed by artists raises increasingly pressing questions related to preserving their work as part of our cultural heritage. Is it possible to conserve digital artworks for the long term? Will only digitally created artwork whose final manifestation is physical survive over time? Can purely digital artworks continue to operate in the distant future and thus provide a digitally functioning legacy for generations to come? Is this matter being adequately addressed by artists themselves, by those who collect their work, or by art and memory institutions? It is argued that there is a need to provide future generations with influential examples of contemporary digital art that use functioning technologies as close as possible to that which the artist intended. Even if artists care about the longevity of their digital work, they are nevertheless failing to conserve it, possibly because they have not learned the skills to do so. Curators, government art bodies, museums and the institutions involved are aware of the urgent need for this important issue to be addressed. Yet despite significant efforts by leaders in the field of digital art preservation, for current artists and most existing digital artwork it is a matter of too little, too late. Maybe the solution lies in part with the training of artists to recognize the need to facilitate conservation of their own individual digital artworks, as far as is reasonably possible. This analysis of built-in obsolescence within digital art references two born-digital art installations, one purely digital – Sequence by Alex May and Anna Dumitriu, and the other a physical object, made digitally – Exposure by Antony Gormley. The conclusions reached are unsettling for those concerned about the legacy of digital art practice. If art reflects the culture of our time, it follows that artworks representative of our age, namely our ‘digital age’, must be collected and conserved as a cultural legacy for future generations. Memory institutions such as museums and national art galleries carry this responsibility. These institutions together with universities strive to develop effective practices for digital art conservation, and pass on this knowledge by offering education programmes, including university degrees. ‘Restoration is the methodological moment in which the work of art is appreciated in its material form and in its historical and aesthetic duality, with a view to transmitting it to the future’ (Brandi, 2010). ‘In terms of conservation, the strategies applied for painting, sculpture and drawing seem inappropriate for unstable or variable media, due to factors such as hardware and software decay and the obsolescence of technological devices that make it difficult to provide strategies of conservation for New Media artworks’ (Barreca, 2009). The underlying tenets of art preservation according to Michele Cloonan are ‘longevity, authenticity, reversibility and enduring value’ (Cloonan, 2015, p. xv). ‘Paradoxically, new media age faster than “old” media and this fact necessitates a fundamental revaluation of all long-established conservation strategies. Whereas society’s cultural memory is oriented towards longevity and reliability, the operability of digital objects depends on upgrades at ever shorter intervals. The interests of the software industry run counter to the conservation and sustainability of cultural heritage. Therefore, the dependency of technological systems on corporate strategies and market interests is an acute threat to cultural memory’ (Huber in Serexhe, 2013, p. 137). Meanwhile Bernhard Serexhe observes: ‘The resulting functional obsolescence or failure of digital works of art reduces the hitherto valid collecting criteria of longevity, authenticity, and intrinsic value to absurdity’ (2013, p. 24). ‘Over the past decade, a community of researchers, technologists and memory institutions [……] have made substantial progress towards the long term viability of digital content. Individuals routinely hold terabytes of material; organisations hold hundreds of terabytes. The ones that plan for the future have a reasonable level of confidence that they can, [……] keep these collections safe and usable for the next generation. But these collections are fairly simple in form – images, photographs, office documents’ (Farquhar in Delve & Anderson, 2014, p. ix). Through discussion with Jocelyn Cumin, MA Conservation course leader at Camberwell, a list of international memory institutions considered advanced in digital preservation were drawn up. Research into these memory institutions demonstrated that Farquhar’s observation is still true today (Quinn (1), 2016). The websites of the British Library, the National Library of Australia, the National Archives of Australia, America and Canada, and the American Smithsonian Institution show that they are advanced in the fields of creating, maintaining, and conserving ‘simple’ digital records. Born-digital art, when its final manifestation is a ‘simple’ digital object such as a photograph or video, can thus survive to be part of our cultural heritage, as its conservation is well understood and practiced. However, these institutions have yet to adequately address conserving functioning contemporary digital art. ‘A classic example is the artistic work of Nam June Paik. In most cases his works use old television sets as basic components. At the ZKM | Karlsruhe we have huge warehouses, as big as multiplex cinemas, in which we can collect old television sets for such purposes – as well as old light bulbs, and so on. However, the supply will not last for the next hundred years; with any luck, perhaps for the next fifty years. However, this is only staving off ‘digital oblivion’’ (Weibal in Serexhe, 2013, p. 192). ‘Interaction amplifies the preservation challenge, especially when it comes to setting the extents of any preservation plan. [……] interaction is at the core of much software art, and therefore there is no canonical form to be preserved as there might be with a dataset or a document. The extents of preservation actions necessary to protect such art works are thus unclear’ (Delve & Anderson, 2014, p. xLv). ‘The designation born-digital art is used to describe works of media art produced in a digital format from the outset. As distinguished from the generic term media art, born-digital art (genuinely digital art) describes art created exclusively by means of digital media, and which is dependent on this technology for its implementation’ (Serexhe, 2013, p. 599). ‘Only very recently have we come to understand what this system change of cultural memory signifies for media art realized in digital code: the more rapid the technological development, the shorter the “half-life” of works of art. Going by our experience of the past twenty years, we must assume that in view of their rapid cycles of innovation, digital hardware and software have a maximum usability period of less than ten years’ (Serexhe, 2013, p.24). ‘Digital art provides additional challenges. In part this is due to the creative experimental nature of digital art. Artists often collaborate with data analysts, scientists and engineers. They push the boundaries of what can be done. For the current volume, this means that they challenge what can be replicated at all – much less preserved’ (Farquhar in Delve & Anderson, 2014, p. ix). ‘[…..] the re-establishment of the functional properties will ultimately represent only a secondary or accompanying aspect of the restoration, never the primary or fundamental aspect that respects a work of art as a work of art’ (Brandi, 2010, p. 230). ‘In addition to the “reality” of the work contained in its tangible, physical, or digital constituents, there are the effects it produces on viewers and the artists’ intention. These two aspects are often overlooked, even though they must be addressed, especially in the case of interactive works where they are more complex’ (Depocas in Serexhe, 2013, p. 146). ‘It must be admitted that institutions like the Tate Modern in London, the San Francisco Museum of Modern Art, the Nam June Paik Art Centre in South Korea, Le Centre Pompidou in Paris, as well as the ZKM | Karlsruhe are not miracle-workers and, in spite of best efforts, have not succeeded in applying the ambitious aims of traditional conservation practices to digital art’ (Serexhe, 2013, p. 82). ‘The historians of the future will look back and there will actually be a little period of history around now where they really won’t have the information, they don’t have the correspondence between world leaders and great scientists. They don’t have the actual raw data of the great scientific experiments that are done. They don’t have the music that was written during that period. The art that was created during that period. Because we’re in a period now where we are storing things that will not last even our own lifetimes’ (MacLean and Davis, 2000, p. 42). Even today, such are the difficulties of ‘born-digital’ art conservation that despite the research efforts that have taken place in recent years, Janet Delve of the Future Proof Computing Group, and David Anderson, CITECH Research Centre Director, in Preserving Complex Digital Objects, state that: ‘The preservation of software art is both a research field in its infancy and an emerging field of practice’ (Delve and Anderson, 2014, p. 341). According to Pip Laurenson (2007), Head of Collection Care Research at Tate Modern, when museums and art institutions consider new acquisitions, conservation is a major part of their risk management criteria (Laurenson in Cloonan, 2013, pp. 309-311). During a conversation (Quinn (2), 2016) following Douglas Dodds’ talk V&A – Pioneers of Digital Art, he agreed that the ability of the V&A to conserve a digital artwork was a deciding factor when considering whether to acquire it for their permanent collection. As the senior curator responsible for the V&A digital art collection when considering these perspectives, issues concerning the conservation of digital art could thus exclude experimental, technically advanced and complex artworks from permanent collections. If so, it follows that there will be a significant gap in our cultural memory in the very institutions that are entrusted with this responsibility. Research and education is key to resolving the problems raised. Yet despite UK government and art education institutions being aware of the issues, not enough is being done to support either, and the situation is set to worsen. Cost pressures are reducing the ability of art organisations and universities to carry out research programmes. Rohn, Curry and Steele (2015) wrote an article in The Guardian last year titled: UK Investment in public-funded research dropped to less than 0.5% of GDP in 2013 – its lowest point in over two decades. UK research funding is also not being directed towards the conservation of digital art itself. Instead, Nesta, the Digital R&D Fund for the Arts in the UK, ‘[…..] supports ideas that use digital technology to build new business models and enhance audience reach for organisations with arts projects’ (Nesta, 2016). The Royal Society (2016) also acknowledges the UK as ‘one of the largest recipients of research funding in the EU, income that is now in jeopardy following the UK Brexit vote. It was reported in the Guardian newspaper recently that Martin Roth, Director of the V&A, said after the ‘Brexit’ vote, that ‘British arts institutions would have to get used to living without European funds’ (Brooks, 2016). The importance of EU funding is underlined by the most recent comprehensive three-year project ‘digital art conservation’ being co-funded by Germany and the EU (Serexhe, 2013, p. 16). Research for this dissertation into UK Universities offering graduate or post graduate degrees in the subject proved that few courses exist. On sourcing websites of all UK University first and post graduate specialist degrees in conservation, only Wikipedia was able to provide a summarized list (Wikipedia, 2016). Of these, only two universities, the University of Glasgow and Kings College London offered digital conservation as degrees, and only the former specifically addressed conservation of digital art. In a random sample of UK general BA and MA courses in Fine Art, none included digital art conservation in their curriculum. This fact results in a lack of awareness of the issues raised in this paper, and a restricted supply of suitably qualified people to address them. ‘this interaction of components leads me to think that all digital art is a performance, and more than a performance between the viewer and the object’ (Serexhe, 2013, p. 224). ‘a bio-digital installation created by artist Anna Dumitriu, the emerging technology of whole genome sequencing of bacteria. Dumitriu’s artistic research has led to her learning how to sequence an entire bacterial genome of the Staphylococcus aureus bacteria that lives on her own body’ (Papadimitriou, Prescott, & Rogers, p. 95). Quinn, T. (3) (2015) Sequence Exhibited at the V&A Digital Design Weekend [Photograph]. In August 2016, Alex May discussed Sequence in an interview near his studio in Brighton (Quinn (4), 2016). May’s contribution to this work was to visualize the DNA spiral sequence in 3-D and Virtual Reality. May used his own proprietary Open Source software Fugio (Bigfug Creative Software, 2016) to display a digital file of the DNA spiral in 3-D. Fugio enabled this display, using an Oculus Rift Virtual Reality headset, physically tethered to a Raspberry Pi microprocessor running the Windows 10 IOT Operating System. This list of digital hardware and software gives a detailed, but far from complete, view of the many dependencies and interdependencies of the technology used. All these elements will change in the future. Software providers will release new versions of software and drop support for older versions. When the virtual reality headset devices are upgraded, they will demand ever faster processors and graphics cards in the supporting computer hardware. These changes will force the technical environment supporting Sequence to be upgraded, most probably altering the viewers experience of the artwork. Whilst the Oculus Rift was generally released in March 2016, there are a host of competitors such as VIVE, developed by HTC and Valve Corporation, operating different software environments to achieve similar ends. Consequently, output for the Oculus Rift will not run on the VIVE and vice versa. Microsoft recently released Hololens Augmented Reality headsets, that are not physically tethered to a computer, and which allow virtual objects displayed in 3-D to be seen in the viewers own physical environment (Microsoft, 2016). So the race for commercial dominance in this sector is far from over. Not all formats will survive. Windows Central (2016) Microsoft Hololens app team reaches halfway point in making galaxy explorer [Photograph]. An example of commercial competition resulting in the demise of a superior format technically, is between Betamax and VHS for video player devices. This was reported on by Jack Schofield, Computer Editor, of the Guardian (2003). Betamax was eventually discontinued in 2003 because it lagged well behind VHS in gaining the support of the major film and television production studios to produce content in their format. Without this support, Betamax had little content for their video players compared to VHS, which significantly influenced the consumer decision making process concerning which player to buy, resulting in the demise of the product. This could be the fate of the Oculus Rift upon which Sequence relies. If so this would also eventually force a change in the hardware and technical environment that supports Sequence. Alex May recently said that his modular Open Source Fugio software will allow him to maintain Sequence through technological change by personally writing different plugins to accommodate new hardware and software. His hope is that many users of Fugio will write their own plugins, which will also be available as Open Source for other users to deploy, in the same way that Arduino and Raspberry Pi code can be downloaded from the Internet for free today (Quinn (4), 2016). If so the technical challenge may be reduced, but it will not go away. Moreover, the free Fugio Open Source software is in direct competition with the well-established, but very expensive, Max MSP (Cycling72, 2016). Both are high level, modular, visual programming languages with graphical user interfaces, which create the specific code needed to build a complex digital multi-media art installation. Fugio is new and Max MSP has a long history of use by composers, performers, software designers, researchers, and artists to create recordings and performances. Fugio is currently supported, developed and maintained by one very dedicated, technically skilled, practicing artist, and a large well established company Cycling72, in San Francisco does the same for Max MSP. Fugio may possibly be better, and could get fast acceptance by other artists because it is free, but it still has a lot to achieve in order to catch up with its competition. The question remains whether Fugio will survive. When May was asked whether born-digital installations will in general survive as working examples of our cultural heritage he replied “probably not” (Quinn (4), 2016). Interestingly, this was a similar response to the one the author received in an interview with Paul Coldwell, Professor of Fine Art, Researcher and Artist at UAL Chelsea (Quinn (5), 2016). Such digital artworks will only last until their hardware or software is no longer available, or when the first component fails that cannot be fixed or replaced. They will also not last if the updated work no longer significantly resembles the original, or the collector or institution can no longer afford the price for its upkeep. Thus it is concluded that purely digital art installations are not made to last. However, artists themselves can contribute substantially to the task of ensuring that their complex born-digital art installations survive. ‘[……] the documentation of the artist’s intent should be considered as guiding principles for conservation. Museums interview artists, recording as much of the data as possible about the artwork. Today the artist is much more involved in the process of conservation, because without good documentation of the artwork it’s difficult to present the work again in the future’ (Barreca, 2009). Barreca’s views are supported by a very detailed and informative article written last year by digital artist Rafael Lozano-Hemmer, in which he suggests a comprehensive list of steps ‘before’, ‘while’ and ‘after making’ that an artist can take to conserve their own born-digital artwork (2015). 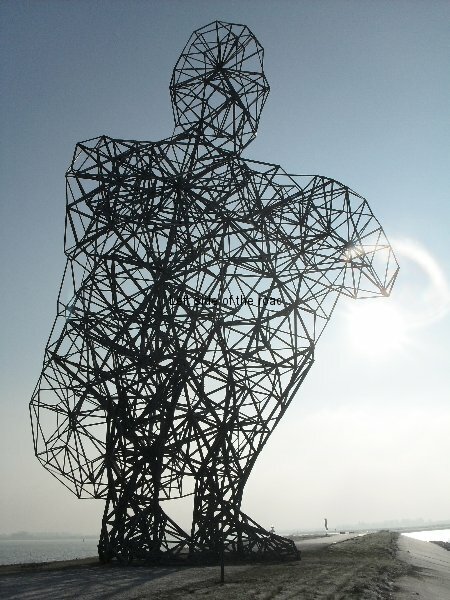 An example of another born-digital artwork is Exposure by Antony Gormley, where the final manifestation of the work is a physical sculpture. Exposure is a nearly 85-foot high, 60 ton crouching male figure made out of steel girders and sited on a sea dike in Holland. The artwork is concerned with the issues of global warming. If sea levels rise, the sculpture will be gradually submerged, and if the dike is raised in response, the figure will be progressively covered by the land. It acts as a permanent reminder of the effects of global warming and is in effect a physical barometer of any change in climate conditions that may occur. In keeping with the principle of environmental conservation, Gormley intended to make the sculpture to be seen from far away, and with the least amount of material, through which the ground and sea were clearly visible. As a result, he decided to construct a huge figure in the smallest number of metal struts that would describe the body (Gayford, 2012). Harrison, M. (2) (2010) Exposure Steel girders [Photograph]. Harrison, M. (1) (2010) Exposure by Antony Gormley in Lelystad, north Holland [Photograph]. ‘First, software developed by Roberto Cipolla and his team at the University of Cambridge transformed photographs of the cast into a fully rotational 3-D computer model. This was then translated into an open steel lattice with help from an algorithm devised by Sean Hanna of University College London. Next, engineers at Royal Haskoning drew up a detailed design. Using a webcam, the engineers then monitored the construction process – carried out by the Scottish steel fabrication firm Had-Fab – to ensure that the sculpture was developing as it should’ (Gayford, 2012). Tekla. (n.d.) Exposure sculpture: Turning vision into reality [Photograph]. Despite the fact that this sculpture was born-digital through multiple and complex digital processes, the final manifestation of the work as a physical object, does not depend on these processes for its longevity or conservation. The conservation challenges are well understood and are the same as for traditional sculpture: it is made conventionally using the same physical material, and exposed to similar external conditions. It can thus be concluded that Digital to Physical art is made to last, and can be part of our future cultural heritage. Evidence suggests that current and future research may lead to more functioning purely digital artwork surviving, but the journey has only just begun. Currently, research funding available for the arts in the UK is declining, as is the proportion of this funding that is directed towards the conservation of digital art. Only one UK University offers degrees in digital art conservation. Much needs to be done to include an awareness of digital art conservation in Fine Art BA degree courses in the UK, and for more universities to offer this specialisation in post graduate degrees. Most born-digital art installations will not be part of our future cultural heritage as they currently cannot be conserved for the long term. In the meantime, artists themselves must conserve their own work until the research and practice of digital art conservation is considerably more developed than it is today. The key recommendation of this paper is that if artists engaged in a digital fine art practice wish their work to have any sustainable future, they should follow the example of Rafael Lozano-Hemmer. He suggests a comprehensive list of steps ‘before’, ‘while’ and ‘after making’ that an artist can take to conserve their own born-digital artwork. As a result of following these steps in the past, Lorenzo-Hemmer’s own work Subtitled Public was acquired by the Tate (2015). Barreca, L. (2009) Conservation and documentation of new media art. Available at: http://hdl.handle.net/10022/AC:P:10039 [Accessed: 26 September 2016]. Bigfug Creative Software (2016) Fugio. Available at: http://www.bigfug.com/software/fugio/ [Accessed: 28 September 2016]. Brandi, C. (2010) Theory of Restoration. Available at: http://isites.harvard.edu/fs/docs/icb.topic822683.files/Brandi_Theory%20of%20Restoration%20I_sm.pdf [Accessed: 26 September 2016]. Brooks, R. (2016) ‘German V&A chief quits in sorrow at Brexit defeat’, The Sunday Times, 4 September, p.3. Cloonan, M. V. (ed.) (2013) Preserving our heritage. Perspectives from antiquity to the digital age. Chicago: American Library Association. ‘Conservation and restoration training’ (2016) Wikipedia. Available at: https://en.wikipedia.org/wiki/Conservation_and_restoration_training#United_Kingdom [Accessed: 26 September 2016]. Cycling74. (2016) Max connects objects with virtual patch cords to create interactive sounds, graphics, and custom effects. Available at: https://cycling74.com/products/max/ [Accessed: 22 August 2016]. Delve, J. and Anderson, D. (2014) Preserving complex digital objects. London, United Kingdom: Facet Publishing. Gayford, M. (2012) Old media, digitized, make new forms. Computers are changing art in unexpected ways. Available at: https://www.technologyreview.com/s/429643/old-media-digitized-make-new-forms/ [Accessed: 26 September 2016]. Lozano-Hemmer, R. (2015) Best practices for conservation of media art. Available at: https://github.com/antimodular/best-practices-for-conservation-of-media-art [Accessed: 26 September 2016]. MacLean, M. and Davis, B. (eds.) (2000) Time and bits: Managing digital continuity. Los Angeles: Getty Research Institute, U.S.
Microsoft (2016) Hololens: Pushing the limits of storytelling. Available at: https://www.microsoft.com/microsoft-hololens/en-us [Accessed: 26 September 2016]. Nesta (2016) Digital R&D fund for the arts. Available at: http://www.nesta.org.uk/project/digital-rd-fund-arts [Accessed: 26 September 2016]. Papadimitriou, I., Prescott, A. & Rogers, J. eds. (2015) Crafting our digital futures: As part of V&A digital design weekend 2015. London: Uniform Communications Ltd.
Quinn, T. (1) (2016) Digital to physical – made to last? Email Correspondence with Jocelyn Cumin, MA Conservation, UAL Camberwell. Available at: https://terencemquinn91.org/2016/09/26/digital-to-physical-made-to-last-research-paper-additional-references/ [Accessed: 26 September 2016]. Quinn, T. (4) (2016) Digital to physical – made to last? Alex May Interview 22 August 2016, Brighton. Available at: https://terencemquinn91.org/2016/08/22/digital-to-physical-made-to-last-alex-may-interview-22-august-2016-brighton/ [Accessed: 26 September 2016]. Quinn, T. (5) (2016) Digital to physical – made to last? Prof. Paul Coldwell interview 27 July 2016, UAL Chelsea. Available at: https://terencemquinn91.org/2016/07/27/digital-to-physical-built-to-last-prof-paul-coldwell-interview/ [Accessed: 26 September 2016]. Rohn, J., Curry, S. and Steele, A. (2015) ‘UK research funding slumps below 0.5% GDP – putting us last in the G8’. The Guardian, 13 March. Available at: https://www.theguardian.com/science/occams-corner/2015/mar/13/science-vital-uk-spending-research-gdp [Accessed: 26 September 2016]. Schofield, J. (2003) Re: Why VHS was better than Betamax. Available at: https://www.theguardian.com/technology/2003/jan/25/comment.comment [Accessed: 15 August 2016]. Serexhe, B. (ed.) (2013) Digital art conservation. Preservation of digital art: Theory and practice. Germany: Ambra V and ZKM Centre for Art and Media. The Royal Society (2016) The UK and EU research funding. Available at: https://royalsociety.org/topics-policy/projects/uk-research-and-european-union/role-of-EU-in-funding-UK-research/uk-and-eu-research-funding/ [Accessed: 26 September 2016]. Quinn, T. (2) (2016) Conversation with Douglas Dodds, Lumen Prize, 28 September. Harrison, M. (1) (2010) Exposure Antony Gormley, Steel girders [Photograph]. Available at: https://www.technologyreview.com/s/429643/old-media-digitized-make-new-forms/ [Accessed: 3 October 2016]. Harrison, M. (2) (2010) Exposure by Antony Gormley in Lelystad, north Holland [Photograph]. Available at: http://michaelharrison.org.uk/wp-content/gallery/exposure-antony-gormley/lelystad-exposure-06-28-11-10.jpg [Accessed 3 October 2016]. Tekla. (n.d.) Exposure sculpture: Turning vision into reality [Photograph]. Available at: https://www.tekla.com/uk/references/exposure-sculpture-turning-vision-reality [Accessed: 3 October 2016]. Windows Central. (2016) Microsoft Hololens app team reaches halfway point in making galaxy explorer [Photograph]. Available at: http://www.windowscentral.com/microsoft-hololens-app-team-reaches-halfway-point-making-galaxy-explorer [Accessed: 3 October 2016]. This entry was posted in Uncategorized on October 5, 2016 by terencemquinn91.